On leaving High School i continued my education at college enrolling on a BTEC Beauty Therapy Course. After a year i enrolled on to a BTECNational Diploma in Sports Science Studies passing with Merits and Distinctions. I then returned to my studies in Beauty Therapy as i previously only completed the first year. Within this year of 1996 i completed my NVQ 2 & 3 (V.T.C.T.) in Beauty Therapy also i qualified in Aromatherapy (I.I.H.H.T.) and Epilation (I.H.B.C) . Further studies followed, i took my Masters Diploma in Sports Therapy, followed by reflexology (I.I.H.H.T.) and many other holistic courses. Having gained experience as a full time Beauty Therapist during 1996/97 I made the decision to start up my own business by offering a mobile service for Beauty Therapy in Wigan and the surrounding areas. My next step on the ladder was to move from mobile into premises in Standish, Wigan and as my business grew and became more established, in 2000 I relocated to a larger two storey building in a more central location in the town. With many years experience I now had the opportunity to pass my knowledge and enthusiasm on to students in the field of beauty therapy. I enrolled on a ‘City & Guilds Teacher Training Course’ in 2001 and started teaching VTCT at Runshaw College. This enabled me to pass on my extensive knowledge within the industry. In 2004 the two storey salon was completely refurbished, offering traditional beauty & holistic treatments including far eastern therapies/rituals, ‘Athena Beauty Spa was born’. I devised comprehensive accredited beauty and holistic training courses within that year and renamed My business ‘Athena Beauty Spa & Training Centre’’. Athena Beauty Training Centre offers intensive short courses, specialising in one to one training and small group training, ensuring each student is given a great deal of individual attention and personal tuition. Having obtained my qualification as a City and Guild Assessor in 2005, I further added a variety of courses I had trained in to my training centre covering a range of subjects including, Micro- Dermabrasion, Lymphatic Drainage Massage & Far Eastern Massage Techniques. 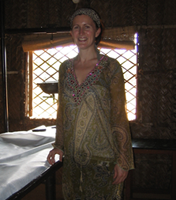 In January 2010 I had the opportunity to travel to Goa, India to further my passion and interest in Ayurvedic Therapies including Abhyanga Massage, Pizichilli, Shirodhara, Udvartana and other therapies, qualifying in a ‘Kerala Panchakarma Therapist Program’. March 2011 I further updated my skills as an ‘Ayurvedic Therapist’ with Deepa Apte in London one of Europe’s leading medical doctors, yoga teacher and Ayurvedic Practitoner. Being able to practice and learn these ancient Indian therapies over 5000 years old, was an experience I will never forget! My visit to India has reaffirmed Ayurvedic living encompassing yoga and meditation giving me an enriched outlook on life. I hope to return to this wonderful country where the knowledge of these healing therapies are awaiting rediscovery. Athena Beauty Training Centre has been very successful, training many new students and returning students from both the UK and internationally. With experienced and qualified tutors on board offering their wealth of experience , Athena Beauty Training Centre now offers further comprehensive fast track courses in Anatomy and Physiology / Health and Safety, Hawaiian Massage, Aromatherapy, Crystals, Shirodhara, Holistic Facials, Oriental Facials, Thai Body Work and much more. All courses are taught in an innovative professional manner with small classroom sizes to enable a great deal of personal tuition and flexibility in teaching methods. Throughout the training period student feedback is encouraged in order to achieve individual aspirations and to tailor the course delivery to reflect personal knowledge and experience of the chosen subject. I look forward to welcoming you as a student at Athena Beauty Training Centre and assisting you in both your personal and career development. Call 0151 2036110 or send an email to info@athenabeautytraining.co.ukor alternatively fill in our contact form.